God Bless Giraffes » Harrumph! Truth be told, giraffes are my favorite animal. They are beautiful and have an elegant stride, oh, and compelling eyes. So, I have been emotionally caught up in reportage of Europeans and Americans who shoot giraffes for sport. Trophy hunting of giraffes is by no means dangerous, but it is very expensive $10,000 or more for the experience (plus $2,000 trophy fee). 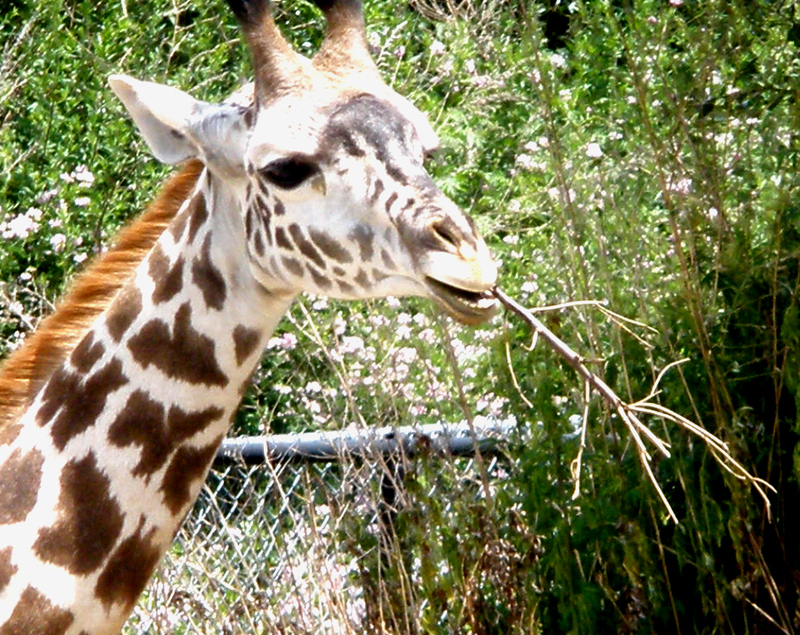 An understandable giraffe myth is that they make no sounds. While they often do not vocalize, they can — moms bellow for lost offspring, males hoping to mate snort, all will bleat on occasion and such. More obviously, both in the wild as well as in zoos and preserves, they munch plants all day. They run and play with each other. They are gentle herbivores, who are violent rarely. Their only real weapon is a super-strong kick, which can maim or kill a predator such as a lion. Males will sometimes fight each other over a female by swinging their heads at each other. Another truth from me is that I am no adherent of ahimsa. I swat mosquitoes, for example, although yesterday, I did remove a fair sized spider from my bathroom by hand, placing it on plants on the deck to scurry off to safety. Moreover, I regularly eat muscle meat and fish that I purchase. I’m country enough to know chickens don’t grow in shrink-wrapped packages. In fact, I’ve eviscerated fish, plucked chickens and such. It is the sport aspect — the thrill of the kill — that I have never wanted nor understood. I grew up around hunters. I think of my mother’s brother and his three sons. They loved shooting animals and particularly pleased my country grandmother when they showed up with a deer haunch. They butchered it and we had venison out of the freezer for many meals, including actual mincemeat pie. I have species prejudice. The idea of killing a whale or any cetacean appalls me. They are far too close to us in brain capacity and are very human in many ways, short of being cruel and ambitious. From there, I feel an affinity for the great and lesser apes. I identify less and feel less protective of other species, particularly vermin sorts like rats and squirrels. For learned emotional reasons, I would not kill nor eat a cat, dog or other pet variety. While not strongly anti-hunting, I do listen to hunters, who like fishermen love to talk about what they do. Many I have known from childhood, into school and college and as an adult, fall into several types. A few truly seem to be those conservation type. They enjoy the outdoors, truly believe that they keep herds healthy through culling, and eat their kills. My emotional problem is with the many I have known or heard who plainly simply like to kill. The glee they express in describing shooting animals and watching them struggle and die is freaky, scary. We should be glad they have an outlet and are not driven to turning on us. 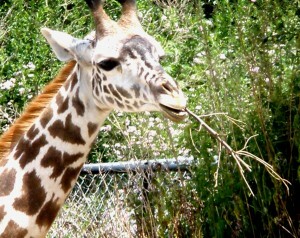 Likewise for giraffes, there are numerous descriptions and short videos that illustrate both types. Search trophy hunting giraffes to find both safari companies and people opposed to such doings. Oddly, the videos of tourists killing giraffes, posing (invariably under an arced neck) and bragging about it are on both types of sites. One family’s murder is another’s adventure. Giraffe hunting is not new, of course. The picture above is a pre-WWI one with natives who with their prey. They would eat the animal and sell the hide — old style and not for amusement. Seeing the videos of the modern version reminds me of a visit to the George Eastman House in Rochester, NY. Mr. 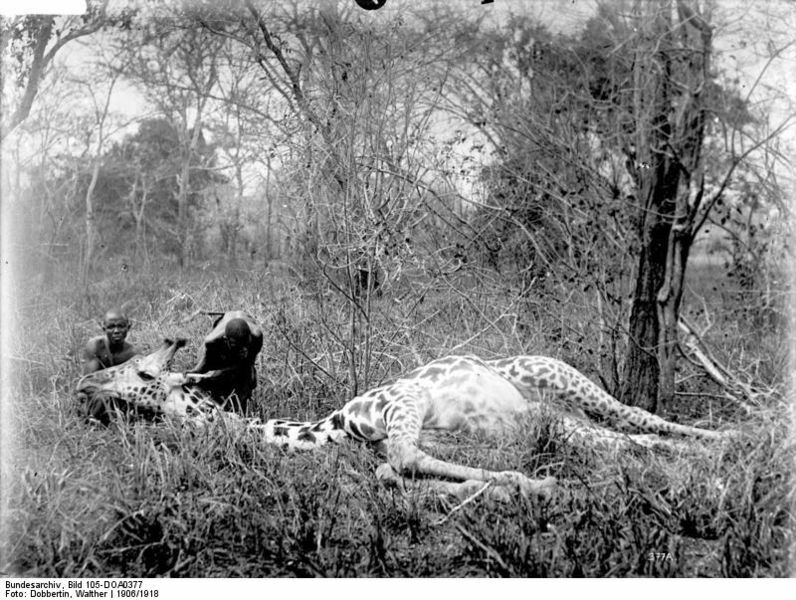 Photography loved killing African mammals. His rooms share the building with photography museum. There are elephant and other heads on walls, desks covered in hippo hide and such, and outsized artifacts like umbrella stands made of elephant or hippo feet. He was quite a control freak, it seems. His journals specify how he micromanaged each trip, down to how many socks of what type each person would bring and precisely what the provisions would be for every meal. In the end, so to speak, he hunted himself as well. He was getting physically feeble and rather than forgo such excursions, he brought in acquaintances one or more at a time, conversing at length to show he was rational (and his will would not be contested), and then killed himself with his favorite pistol. The journals and pistol are on display a floor above the animal trophies. Back to giraffes, I am fond of them. As they threaten no one and they are not overpopulated, why should anyone kill them? Short of because humans are atop the food chain and can fairly much slaughter animals at will, I don’t see any good reason. Those who walk near these 16 to 19 foot tall herbivores and shoot them dead speak on those videos proudly. It does not seem like much of a challenge or accomplishment. In South Africa the giraffe is invariably hunted on horseback a form of sport which has always had great attractions for English sportsmen. There is nothing finer in nature than the sight of a troop of giraffes in full flight and the excitement of the find and the run up is intense. In its slower paces the giraffe with its curious gliding walk is extremely deceptive It is in reality travelling at a rapid rate. When thoroughly roused these animals are capable putting first rate hunting horses to their utmost speed. It is well to remember that unless the hunter plies sjambok and spur and rides his very hardest at the flying troop in the first two miles of chase he may lose them altogether. At a steady slinging gallop giraffes will travel for hours and wear out a horse but if chased very hard and forced beyond their pace early in the run the hunter will be enabled to ride close up to the particular beast he may single out and put in his shots from the saddle. Some hunters prefer to get up within a hundred yards jump off and fire. In the opinion of the writer and of many experienced African sportsmen it is better to push one’s horse close up to the stern of the giraffe and within a few yards fire from the saddle. A good South African hunting pony needs little guiding in a run of this description and the rider can drop his reins and safely use both hands. The best point to aim at whether on foot or on horseback is the root of the tail. The giraffe’s body is very short and a well planted solid bullet travels right into the vitals of the animal and speedily brings it down broken limb will also effectually bring down giraffe. The same text notes that giraffes are defenseless against humans. The only danger is if one is dumb and clumsy enough to come in from behind and get kicked. Anyone with a rifle can kill a giraffe. The guides drive a short distance away. There’s no pony chase, mounted shooting or risk. The giraffes are not skittish and seem to observe the hunters with curiosity, at least until the shots bring down one of theirs. Putting money into the local economy does not seem at all a justification here. Again, there is no need to cull giraffes, they harm no one and nothing, and hunting them is neither challenging nor dangerous. It seems the hunters should be ashamed to return with a hide or head of these gentle giants. As the guide company repeatedly point out, such hunts are legal in numerous countries. They offer menus such as on this page, with the per diem as well as the trophy fee, for the long list of animals you can kill. I suppose that’s free enterprise, African style, although U.S. and Canadian hunting preserves have similar plans on less exotic beasts. It is not in my nature to hunt for sport. I am sad that beautiful, gracious, gentle giraffes die for the titillation of tourists. With the many fulfilling ways to get pleasure in this life that do not bring pain and death, they have chosen most poorly.